Red markings under rostrum of caridinas. Today i collected the batch of crystals from the breeder. Still acclimating them very slowly till tds is compatible to my tank. Saw a few of them had this weird reddish markings or growth under their rostrum? So worried if it is a disease or fungal infection? Have attached pictures best i can to illustrate what and where i mean is the affected part. I will not put them in my main tank till we can understand what it is as my experience with crystals to date is not on par, i need to check with everyone here. Hope i am over reacting and this is just their natural colouration. I understand why you would be extra sensitive/worried with your previous experience with these shrimps! I also did a quick google search and some of those had red bits on the very front. They look very nice and quite a high grade, you are good at getting clear photos. Hopefully you will get some nice shrimplets from them. Just dont want them to be sick or anything. Have been reading the sub threads here on shrimp health. Have also been goggling this. Cant seem to find anything. 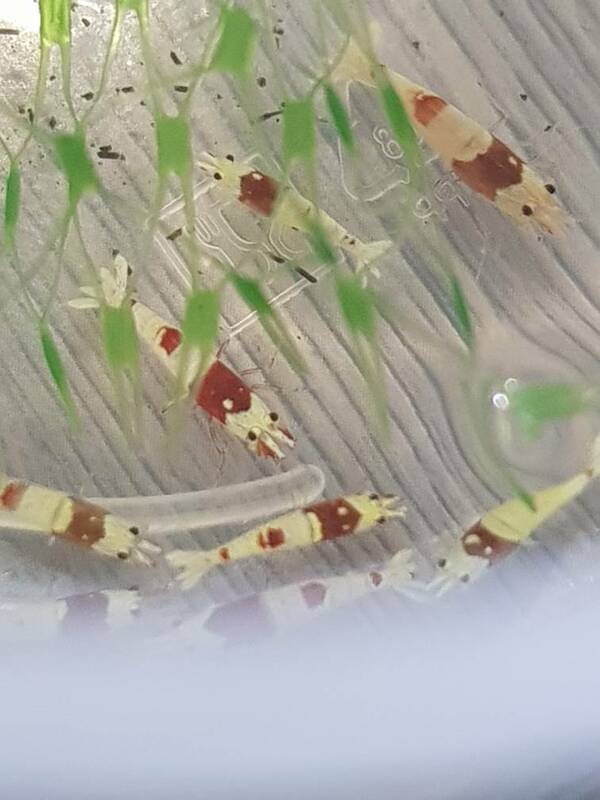 I am over reacting as usual, saw the link you sent, yep some of the shrimps on there have the same red markings. So i think we are good. Today is day 3 and the shrimps are still in the cup. I wanna just take things real slow with them. No shock, just a very gradual, peaceful transition. Hopefully an uneventful one too! Can we have a side shot please? close up of the head. Great to hear that everything looks to be going well and you haven't lost any of the new shrimps! I took another look at the photos and I don't know whether it is important but the red bits on the front are the same red as the pattern on the body so to me that also would make me think it is just part of the colouring, but I am only guessing there! Maybe you shouldn't read too much about diseases at this stage? But good if it has given you peace of mind! A burst of photos attached! I took 17 shots because they kept moving! Hope you can at least find one good shot? OOOOO lots of pics, that's what we like. I can see the one with the red legs, very nice. And a couple without the red spot on the back as well. Hopefully JayC will give you the all clear and they can get into their waiting new home. They look good quality and grade shrimp to me, you did well there! 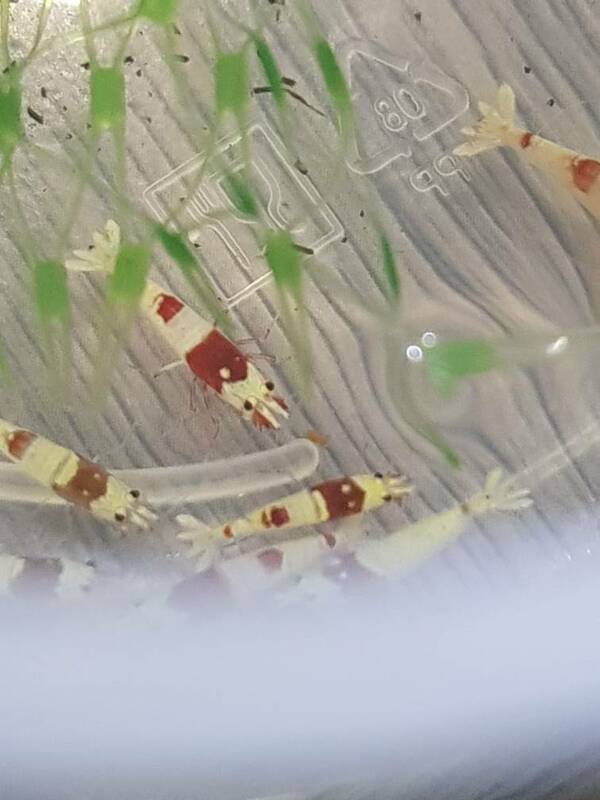 Just realized i never really looked at a crystal shrimp so close to notice their markings and these are just a little strange to me? They are still in the cup. Very very active and no one has died, yet. I will need to remove some water soon. Fast or slow acclimation depends on how much difference there is between your water and the water they came in. First measure the water parameters, then use the TDS pen to track changes. Roughly, if the GH and KH difference are less than 2, then you can probably acclimate over 2 hours. If greater than 3, I would say a day or more. Also what you can do is hang your big cup inside your tank so the water temperatures equalize. I don't see anything wrong with these CRS. In fact they are very good quality CRS. They might even be culls from a Pure Red Line (PRL). Some are almost there with red legs. Here is a PRL for comparison. I am so happy to hear this from you. Thank you@sdlTBfanUK simon as well. They are most prob good to go into the tank on sat. Love you guys very much. Thank you for all the help. Apologize for this dumb quesrion but i had just wanted to be sure. This is an update on the crystals. None have died so far. They have coloured up beautifully as well. FANTASTIC NEWS! Long may it last. Great pictures. Hope the yellows are still doing well also? Every nice. Those are some good quality CRS. Love what you wrote "Long may it last." I am hoping for that! Yep the yellows are doing so great! She delivered those in her tummy and it seems i got 2 more berried?! One could be her again im not very sure! Lots of yellow tiny shrimps hopping around in the tank right now. I am so very happy to see progression and results! All thanks to everyone guiding me here, it was quite the learning journey. Still figuring out how that thing works as it comes with an attachment for an airline hose?? It will filter in and out the same water as the tank? They are so fun to watch and beautiful to look at. They really do seem more fiesty than neo caridinas when it comes to feeding? Haha just thought its weird but they dont seem to like sharing their food.